DUSTIN HOFFMAN in "Kramer vs. Kramer", Jack Lemmon in "The China Syndrome", Al Pacino in "...And Justice For All", Roy Scheider in "All That Jazz", Peter Sellers in "Being There"
SALLY FIELD in "Norma Rae", Jill Clayburgh in "Starting Over", Jane Fonda in "The China Syndrome", Marsha Mason in "Chapter Two", Bette Midler in "The Rose"
MELVYN DOUGLAS in "Being There", Robert Duvall in "Apocalypse Now", Frederic Forrest in "The Rose", Justin Henry in "Kramer vs. Kramer", Mickey Rooney in "The Black Stallion"
MERYL STREEP in "Kramer vs. Kramer", Jane Alexander in "Kramer vs. Kramer", Barbarie Barrie in "Breaking Away", Candice Bergen in "Starting Over", Mariel Hemingway in "Manhattan"
ROBERT BENTON for "Kramer vs. Kramer", Francis Ford Coppola for "Apocalypse Now", Bob Fosse for "All That Jazz", Edouard Molinaro for "La Cage Aux Folles", Peter Yates for "Breaking Away"
The winning picture won five awards out of its nine nominations - Best Picture, Best Actor, Best Supporting Actress, Best Director, and Best Screenplay Adaptation (Robert Benton). All four major cast members (Hoffman, Streep, Henry, and Alexander) were nominated, with the two lead stars both winning in their categories. The Best Director award was presented to Robert Benton (with his first directorial nomination and win) - it was a double win for Benton - he also won the Best Screenplay award for his screenplay adapted from Corman's novel. The other two nominated films for Best Picture included Martin Ritt's Norma Rae (with four nominations and two wins - Best Actress and Best Original Song), the authentic re-creation of the melodramatic story of an uneducated, southern textile worker who unionizes her mill, and British director Peter Yates' low-budget sleeper comedy Breaking Away (with five nominations and one win for Steve Tesich's Original Screenplay), an original, coming-of-age tale of growing up, bicycle racing, love, and class distinctions (between town and gown in working-class Bloomington, an Indiana university town). 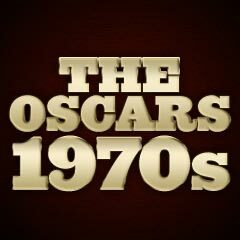 Except for Norma Rae's director Martin Ritt, all the other directors were nominated for Best Director. The fifth director nominated for the award was Edouard Molinaro for La Cage Aux Folles (with three nominations and no wins), a funny French comedy (with English subtitles) about two lovers who masquerade as husband and wife - the film was the biggest grossing foreign-language film ever released in the United States up to that time. 79 year-old Melvyn Douglas won his second and final Academy Award for Best Supporting Actor (his first was for Hud (1963)) as Benjamin Rand - an ailing and dying, political millionaire/financier who is in awe of the homespun wisdom of ignorant and illiterate gardener Chance (Peter Sellers) and brings him to the attention of the President (Jack Warden) in Being There. Meryl Streep (with her second Best Supporting Actress nomination) won her first Oscar (why wasn't she nominated in the Best Actress category? 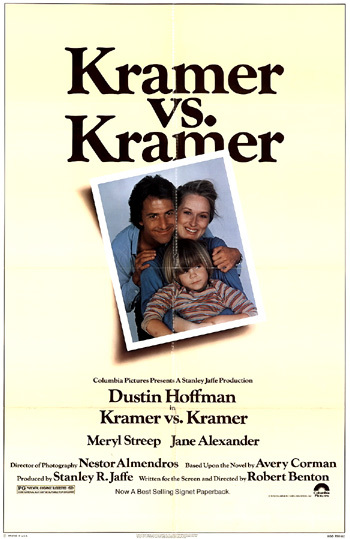 ), as independent Joanna Kramer who leaves her husband Ted and son (Justin Henry), but then returns and sues for custody in a courtroom custody battle in Kramer vs. Kramer. Streep was appearing in her second successive Best Picture, following her performance in last year's Best Picture winner The Deer Hunter (1978). Streep's co-star Jane Alexander (with her third of four unsuccessful nominations) was also nominated as Margaret Phelps - Ted's sympathetic neighbor, in Kramer vs. Kramer. An Honorary Oscar was presented to Alec Guinness this year, although he had already won a Best Actor Oscar for his performance in The Bridge on the River Kwai (1957). By the time of this award, he had also received a Best Actor nomination for The Lavender Hill Mob (1952), a Best Adapted Screenplay nomination for The Horse's Mouth (1958), and a Best Supporting Actor nomination for Star Wars (1977). Woody Allen was not nominated as director or star (as TV comedy writer Isaac Davis) of Manhattan, one of his best films and his first film since Oscar-winning Annie Hall (1977). The film received only two nominations, for Best Original Screenplay (a co-scripted effort by Woody Allen and Marshall Brickman) and Best Supporting Actress (for Mariel Hemingway), while neglecting the performances of its stars Diane Keaton as Mary Wilke, and Michael Murphy as Yale. Allen's film was also neglected for its 70 mm Panavision B/W cinematography by oft-overlooked Gordon Willis - possibly the best work of his career. In fact, Manhattan should have been a Best Picture nominee. The China Syndrome was neglected as a Best Picture nominee (for producer Michael Douglas) and Best Director nominee for its co-scriptwriter James Bridges. Being There (with two nominations, one successful for its supporting actor Melvyn Douglas) was likewise ignored as a Best Picture or Best Director nominee for director Hal Ashby. Martin Ritt was left out of the Best Director nominees for his work on Norma Rae, as was Ron Leibman for his acting role as labor organizer Reuben Warshawky. Dennis Christopher as bike-racer Dave Stohler and Paul Dooley as his father were both un-nominated for their great performances in Breaking Away. And Peter Falk was denied a nomination for his role as masterminding thief Vince Ricardo in Arthur Hiller's comedy/caper film The In-Laws. Marlon Brando as Col. Kurtz was missing as a Best Supporting Actor nominee in Apocalypse Now. Klaus Kinski - in the title role in Werner Herzog's remake Nosferatu, The Vampyre of the original 1922 F.W. Murnau classic (starring Max Schreck) was also lacking a nomination.